Did you know that Lego doesn’t really make Lego tanks? But you can find Lego-type tanks with a company named COBI. With COBI you can also find other tank related things like other types of tanks or bomber planes. COBI also has other things like passenger airplanes even spaceships! All COBI blocks are compatible with leading brands of construction blocks, such as Lego. This is the most popular Lego tank on Amazon in 2018. It’s so awesome! This tank includes 500 pieces and 2 museum worker mini-figures. COBI blocks fit perfectly with normal Lego brand bricks. You can create the whole army scene, called missions, like the video above when you buy the whole COBI construction set. Or you can build your own with the Legos you already have! This is the second most popular Lego-like on amazon 2018. This tank includes one German grenadier and one tan commander and 440 bricks. This tank fought in WWII in Normandy, the battle of the Bulge and the Eastern Front. You can see that the model is super close to the real thing. Even the side flaps are the same, basically. They even have the German sign on the back and a number like the real thing. Th grenadier is carrying a replica of the German Panzer Faust 60M, Tellermine 42 weapon as seen in the picture below. This tank is a little different from the normal tanks we think of. It’s a replica of a WWII tank called the Polish 7TP Tank. This tank includes 365 pieces and one minifig. This tank has a lot of movable parts. This is from the COBI Small Army collection. You can even make a small army of your own! The Small Army WW-Sherman M4A1 Tank Building kit is part of the COBI small Army collection. This set includes 420 pieces for the tank and 2 army minifigs. People who bought this look like they really enjoy it according to their reviews on Amazon. They also say that thy are very impressed with the quality of the bricks. Check out this video. It’s so awesome! 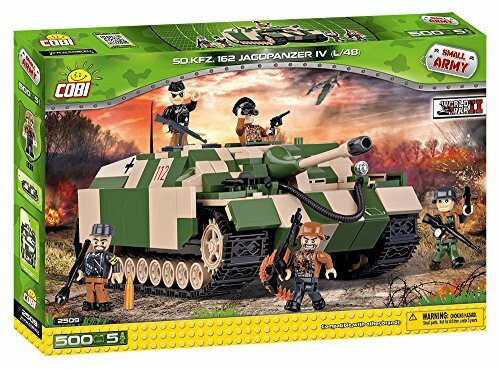 I’m not sure why this is number 5 on Amazon because it seems pretty cool to me and it has more pieces than any of the other tanks above–610 pieces! This tank only has one mini-figure but the pieces fit together amazingly and it’s an awesome model. This tank was built in the United Kingdom and they only made 4,423 of these tanks. The first one was made in 1945. Here’s an old picture of the real thing. It’s pretty accurate. 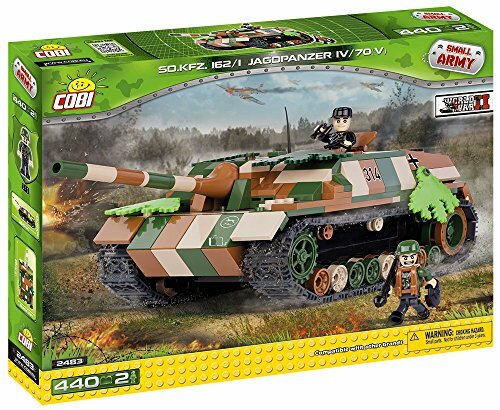 All of the reviews on Amazon for this Lego/COBI tank are 5 star ratings as of November 2018.